One of more than twenty Spaghetti Western era films with the famed Django named attached in the late 60’s and early 70’s. 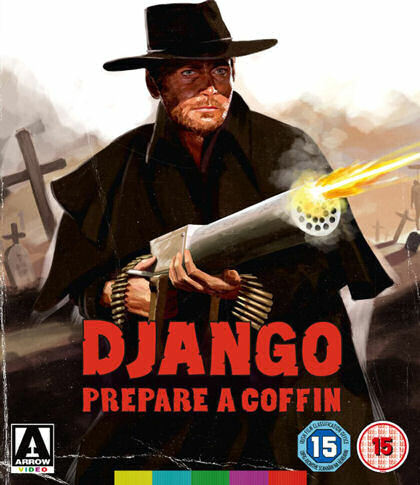 Prepare A Coffin is the unofficial prequel to the original movie, simply titled Django. It’s also one of only a handful of Django films that closely follows the outline laid forth by the original. In this incarnation, our chiseled chin, gunslinger played by Terence Hill seeks revenge on a politician and his outlaw friend, both responsible for the death of Django’s wife. Django takes a job working as a hangman on the politician’s payroll. Instead of lynching the outlaws, Django forms a gang of the supposed dead, he then utilizes to seek revenge for his wife. If a gang of dead isn’t enough, the gunslinger wields a Gatling gun for vengeance. Terrence Hill’s cleft chin of steel fills the Django roll well. His stands out in a film where even the women have chiseled chins. Reflecting the original Django where he drags a coffin through the desert, in Prepare A Coffin Django digs his own grave. A scene that’s used in the unofficial sequel to the original some 20 years later. I’m generally not a fan of movies from this era. The majority of these films are unrealistic with poor acting. The one major exception to this is Spaghetti Westerns. Though they tend to look the same, be just as unrealistic and the acting is just as bad if not worse, I still enjoy them greatly. Django, Prepare A Coffin is no exception. It’s no Serio Leone, Clint Eastwood classic, but this Django duplication holds it’s on with the Sergio Corbucci, Frank Nero predecessor. Spaghetti westerns have never looked better than in the Blu-ray feature. Included is a featurette with a Spaghetti Western expert who covers the lineage of Django films. Helpful for anyone unfamiliar with them. The original trailer is also included. Arrow Video probably provided everything available to add as a feature and there just isn't much for this Italian western. This Blu-ray restoration still brings the Italian west to life.